There are a LOT of free MMORPGs on the market and in this ‘Top best’ MMORPG list, we’ll be looking at the top 5 best anime MMORPGs. It seems like a good 95% of free MMORPGs are based off of anime art styles, but in this list we’re only going to focus on the game’s that are truly anime inspired rather than those that just have somewhat anime graphics. Odds are most free MMORPGs have anime art styles because they originate in the East, mostly in Korea and Japan. The top 5 Best Anime Style MMORPG Games list below was compiled using review data from across the internet and from our own reviews here on MMOHuts. If you’re looking for the best Anime MMORPG to play, you’re at the right place. 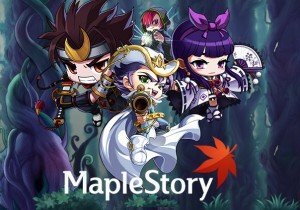 Maple Story is a 2D Side Scrolling MMORPG published by the Korean MMO company Nexon. The game has cute anime styled graphics. The game is enormously popular all around with world and its success led to the development of a fully fledged anime television series based on the game’s cartoony characters and graphics. Grand Fantasia is a top notch anime MMORPG published by Aeria Games. It has really sleek cel-shaded graphics, a whole bunch of playable classes and a neat in game pet system. There are plenty of quests in Grand Fantasia too, so you never need to outright grind! Fly for Fun, usually shortened as Flyff, is a 3D anime styled MMORPG published by Gpotato. The game is enormously popular worldwide and was even hailed as the best online game by Korea’s Ministry of Culture in 2004. Fly For Fun was actually one of the first free MMORPGs to offer flying mounts for players. Mabinogi: Fantasy Life, or just Mabinogi for Short, is a more traditional anime styled MMORPG by Nexon. The game actually has a unique artstyle that I haven’t seen in any other game, as the game features hand-painted textures and unique artsy graphics. Cloud Nine is a 3D anime inspired fantasy MMORPG published by Netgame. It’s actually a vastly upgraded version of Holic Online, The music, graphics, and gameplay are all extremely well done. The graphics are bright and a bit cute. It’s well worth checking out.